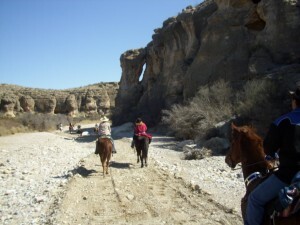 The Ranch is located just north of the Big Bend National State Park. The Stillwell Ranch is located on the north-east side of Big Bend National Park about 7 miles from the park’s north entrance known as Persimmon Gap. Drive about 39 miles South of Marathon, turn southeast onto FM 2627 and travel 6 more miles to the Stillwell Ranch. Overnight camping with your horses is allowed. There are approximately 19 uncovered horse pens. 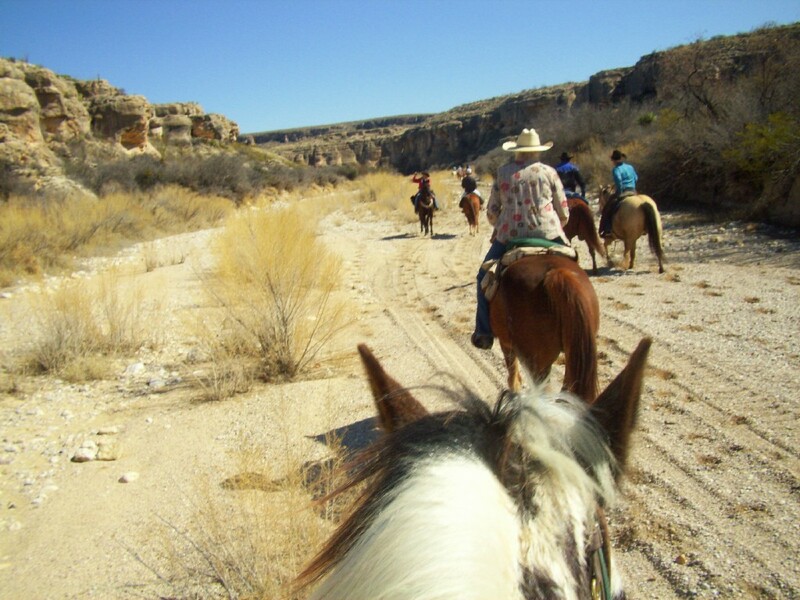 The Ranch also has shower/bathroom facilities, washer and dryers, and free wi-fi. The old fashioned Stillwell Store offers food, drinks, other supplies, and gas (but no diesel). Diesel can be found at the National Park. Be sure to check out the Hallie Stillwell Hall of Fame Museum. $7 adults, $4 children ages 7-11, and free for children ages six and under. Map: Call ahead to ask for maps of the ranch area and National Park. The terrain here is rough with rocks and lots of cacti. Shoes or boots for your horse are essential and long sleeves and long pants (even better, chaps) are recommended for you. You can ride on dirt or gravely roads or on the trails. You can find level ground or steep inclines and canyons to explore. 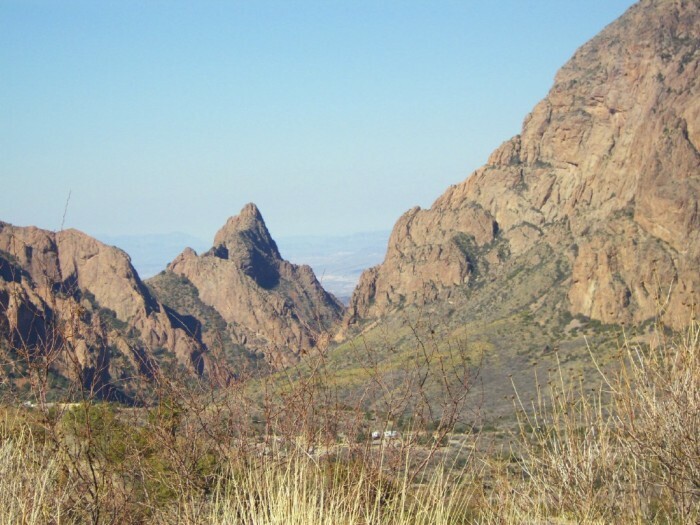 You can gain access to Big Bend National Park from Stillwell Ranch. The Stillwell Ranch is currently for sale with a contract pending. The sale is expected to be closed on in May of 2013. It is believed the perspective new owner wishes to keep the Ranch the same so equestrians may still be able to enjoy the Stillwell Ranch. Author, Lin Sutherland, riding her Spotted Saddle mare, Jewel. 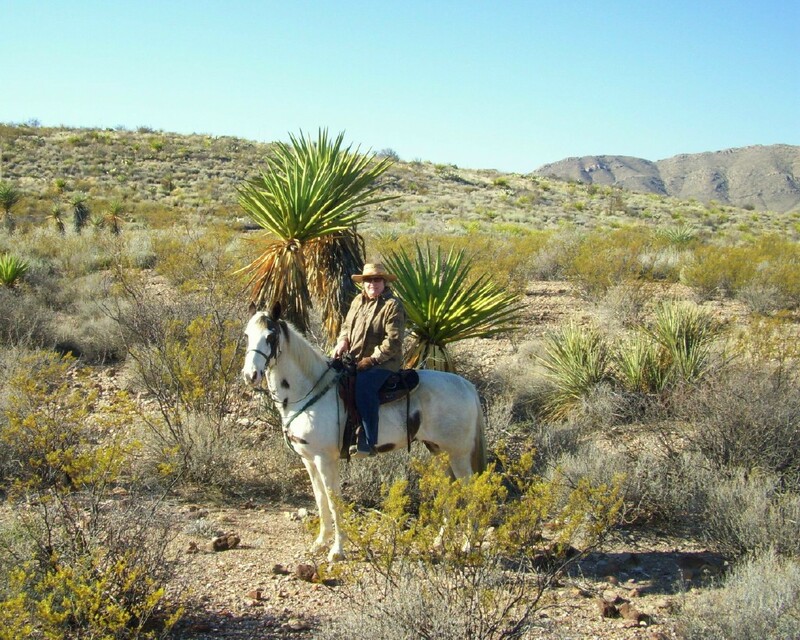 Peggie Kimberlin, aka Redhorse, fearless scout and organizer of the annual Stillwell Ranch ride. Jewel and I are crossing the Trans-Pecos desert with a dozen other riders in Big Bend National Park. It is love at first sight for me. The desert, the river, the mountains – it’s not vast emptiness, it’s a life zone full of animals and plants adapted to this rough and tumble region. 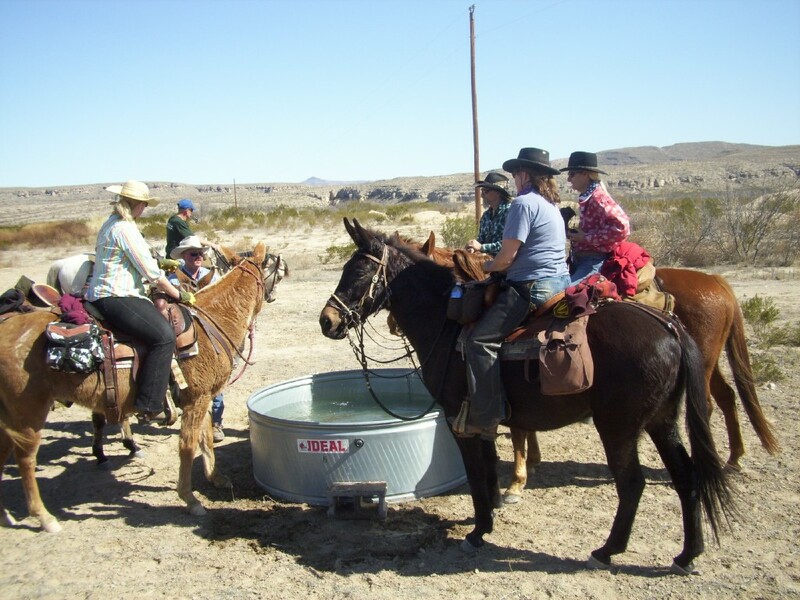 Seventy five riders are camped at Hallie Stillwell’s Outpost, being led by Peggie “Redhorse” Kimberlin – two tough, legendary Texas women. Hallie is here with us in spirit only, having passed away in her 90’s after living in these badlands her whole life. 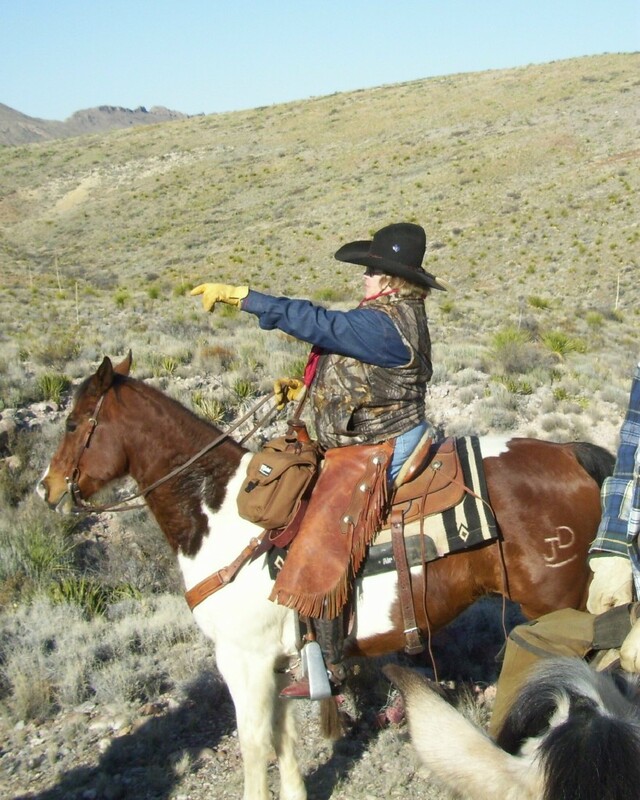 Peggie, a larger than life encyclopedia of information on Big Bend, is leading her 23rd Annual Stillwell Ranch Trail ride. Peggie Kimberlin grew up in the shadow of that great tradition. Just like Hallie, she can ride, shoot and tell an exceptionally good story, and does all of those with regularity. She got the nickname Redhorse from the sorrel she rode for years until it recently retired. No doubt it’s odometer had turned over. Now she rides a good looking red and white paint and sits it quite well as she leads us into the Black Gap Wilderness area of Big Bend. First thing she does is take us “off-roading” up a hill thick with lechugilla, a nasty spiny agave plant with poisonous spikes like daggers, a plant invented by the Devil, no doubt. My sweet magnolia blossom walking mare starts to dance and when I look down I see little ruby droplets on her white legs. Of the many that struck her, one has penetrated her heel bulb and she stops and holds it up to show me. The poison tip stings her flesh, but, there is nothing to do but go on. Like our ancestors who came through here. We rode about 12 miles that day, flusing out red tailed hawk and mule deer and admiring the great open view of the desert. The next day we rode a total of 18 miles down a dry river bed into a canyon with 300′ high walls. It was breath taking. If you looked hard you could find a few red petroglyphs from the Indians who beat us to the place. We passed a lady sitting quietly in the canyon quilting. About a third of the way down, we stopped for lunch in a swirl of sand. Others continued on to the Rio Grande river and Mexico. After a ride like that my riding buddy, and I chose to drive up to the Hot Springs and soak our bones. What a fortuitous lagniappe that is! A big contained area with water bubbling out at a perfect 107 degrees. It sat right on the river, which was running heartily after the rains of the winter. After a good hot soak, I climbed down the rocks to wash my hair in the cold Rio Grande. That’ll wake you up! * The National Park campsites are dry. Stillwell ranch sites have water and electric. And that was a major help since the nights dipped to 26 degrees. Days were perfect though – 60 and bright blue skies. * Everything is done for you! Peggie thinks of all the best trails, gets the best band for the dance, and gets the best caterer for the food. And she’s the only one who can lead people into Maravilla canyon. *The cast of characters. I’ve never met so many odd, interesting, mule ridin’, guitar pickin’, story tellin’ folks. They came from Houston, Lubbock and all inbetween – and Arizona, New Mexico, Missouri, Maine and even Canada! We camped underneath the uncomparable West Texas black sky with two zillion diamontine stars that led the McDonald Observatory to be here. We listened to the coyotes howl and yip. We laughed and told tall tales and sang and fed the camp poodle. We rode in a wagonette pulled by two elegant, silver-dappled Clydesdales and driven by a Border Patrol agent named Cande, who shared the drover’s seat with two adorable dappled weinie dogs. We made new friends and we saw a unique part of the world from the back of a horse. What better could we wish for in our travels? The week was so good it even sparked a few romances – after all it was Valentine’s Weekend. Who wouldn’t fall in love with – or in -Big Bend?